From the Wilmington, Delaware VARO: Jules just emailed me last night to let us know he has met the beast and won. I have no qualms sharing the limelight with Hadit.com. I’m actually the FNG on the block. T-bird set up her site at Hadit at the turn of the century. We’re the newbies. 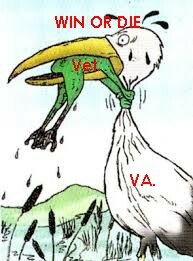 I just wanted to drop you and all the other VA Hadit.com elders a line to thank you for your remotely shared knowledge, comradeship and encouragement during my four year four month struggle with the VBA. With the assistance of my Congressman, Senators, including the late Frank Lautenberg may he rest in peace, ask nod and Hadit.com. I was able to have the long awaited 100% schedular confirmation letter printed out for me at VARO Wilmington, DE this morning. 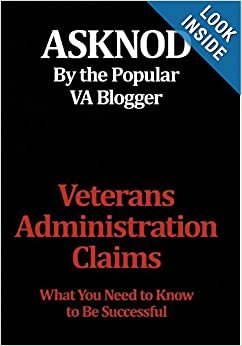 I think in many respects the past four years of attempting to convince the VBA that Psoriatic Arthritis, Psoriasis, Asthma, COPD and skin cancer were disabling was as trying as some the 21 years spent in the Army.Please keep up the good work that you do. Your wit and insight help to sustain and encourage many of your fellow vets. Win or die trying. Jules, as I mentioned in my email, this is what we live for. Both the sites encourages all to never give up. The vision of the frog attempting to strangle the heron is synonymous with Win or Die. Too bad there aren’t more sites for Vets to visit that truly engage in “hands on” help rather than try to dissuade them or beat them to death with their lips. Congratulations on a battle well fought. This entry was posted in Inspirational Veterans and tagged ASKNOD BOOK, asknod.org, asknod@wordpress.com, Gulf War Vets Help, Korean War Vets Help, Service Connection, VA claims, Veterans claims help, Vietnam Veterans Claims Help.. Bookmark the permalink. Excellant and a definite boost for morale. Excellent news–and funny funny image. Jules keep in touch online here so we can learn more from your experiences with the VA. 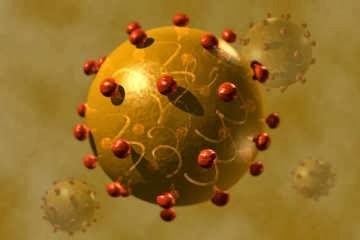 Thank you for the kind words #asknod and for the wonderful source of information you provide on Hep C.
Congratulations Jules, Nod, and Hadit.